World’s largest vertical press – Northern Heavy Industries Group Co. 36,000 ton ferrous metal vertical press. 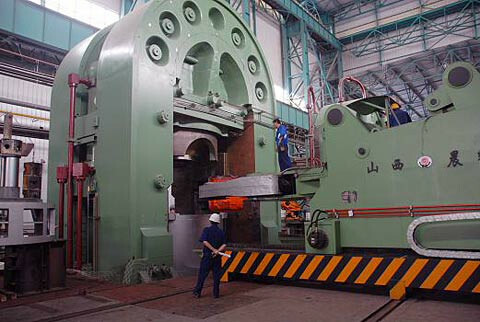 7/6/2009, Norinco Group announced in Beijing that after 3 years of tackling the challenge, and in conjunction with Inner Mongolia Northern Heavy Industries Group Co., Tsinghua University, and other research institutions, they have successfully developed a 36,000 ton ferrous metal vertical press. This is currently the largest ferrous metal vertical press in the world. Vehicle with the most tires in the world. 2008, Suzhou Dafang Special Vehicle Co., Ltd joined together four platform trailer at Yantai DSME SHANDONG CO. to successfully transport a 40 meter wide, 2000 ton segment of a ship, setting at the time the Asian record for transporting the largest tonnage using platform trailers. Yea, OK…So, how come my table-lamp from Walmart does not have the same Quality-Engineering?